Breaking Bad’s Reunion Was in an Audi Commercial?? Last year, the Breaking Bad phenomenon finally came to an end after a truly historic run. Never had a cable show been so successful, so talked about. Episode after episode, in the final season, the show pulled in millions of viewers all waiting to see what would happen to Walter White and Jesse and everyone in between. 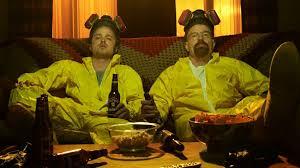 Since that time, there has been a lot of speculation about a Breaking Bad reunion. When AMC announced a spin-off called Better Call Saul, the internet mill got churning again. But in a strange twist of events, it was AUDI that managed to put together a Breaking Bad reunion. Sort of. Earlier this week, a 6 and a half minute video was released to rabid audiences and featured a star studded cast that included: Bryan Cranston, Aaron Paul, and the still gorgeous and funny as all hell Julia Louis Dreyfus. In the mini-comedy, Cranston and Paul run a Pawn shop and Dreyfus attempts to pawn her Emmy award. All of it finally builds up into a somewhat relevant advertisement for Audi. This entry was posted in Culture and tagged Aaron Paul, audi, Breaking Bad, bryan cranston, julia louis dreyfus, pawn shop. Bookmark the permalink.